The Generál-Insped Company was founded in 1986. It’s main scope of activity is international transportation. It operates on a 20.000 m² site, on the periphery of Hidas. 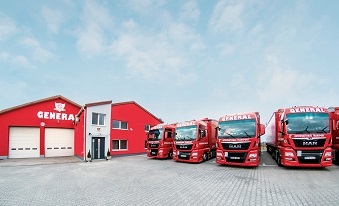 The company operates an office, a truck service workshop, and the vehicle park on its site. It employs 62 people, from which 42 employees are truck drivers. The vehicle park consists of 34 40 tonnes total weight trucks and trailers, and 8 12 tonnes total weight utility trucks. The average age of the vehicles is less than 5 years. By this the company ensures quality and trustworthiness. Copyright © 2009 General-Insped Company. All rights reserved.